After spending an absolutely wonderful two days making our way from Toronto to Pittsburgh and then spending our time discovering the city piece by piece (read more here), it was time to head to Oakland and get ourselves a bit of an education. But not before I had a chance to say one final farewell to Pittsburgh in typical giraffe fashion; I decided to go for a run. Going for a run in a new city is my absolute most favourite way to get acquainted with the life of the city behind the landmarks. What people do early in the morning as they prepare for a full day’s work always says much more about a city than what you see during daylight hours. Thus, I headed out before my husband woke up and decided to take on Pittsburgh by foot. It sounds great, but as soon as I stepped foot outside the hotel, I realized I had no idea which way was best (and safest) to run. After surveying the area, I thought it might be best to stick to the bridges and so I headed once again in the direction of PNC Park towards the opposite side of the shore. As I mounted the bridge and peered in the direction of the waterfront, I saw a mass of people joining together. After a moment of being very confused, I realized that a race was about to start! What luck! A race around the Pittsburgh waterfront! Well, there wasn’t much to do really, except join right in. 5km later, I was at PNC stadium and veering off to avoid being questioned about my non-existent race bib. What a thrill! The runners were really motivating and I got a neat insight into the demographics of active people in Pittsburgh! Men, women, young, old, black, white, everyone came out to have a good time and do something productive with their Sunday morning. The only difference was at the end line there was cotton candy and popcorn waiting instead of protein bars and bananas, but maybe healthier snacks were available inside the stadium – I’ll never know for sure! 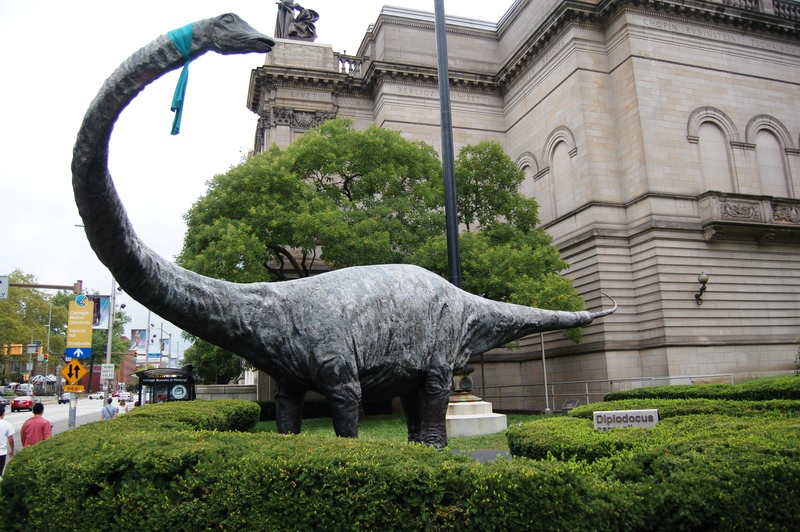 Once I’d returned from my little adventure, we drove the quick jaunt to Oakland and started our tour with a visit to The Carnegie Museum of Natural History. What was guarding the museum? Only my most favourite carnivore on the planet (used to be on the planet): a Brachiosaurus! Ever since The Land Before Time and then again in Jurassic Park, my love for these long-necked creatures has grown, maturing with ever hypothetical portrayal of a giant dinosaur and lover of all things veg. Perhaps it’s the “being really tall” thing connects us, but I have an unfounded affinity to these beautiful creatures. A warm welcome to a world of wonder!